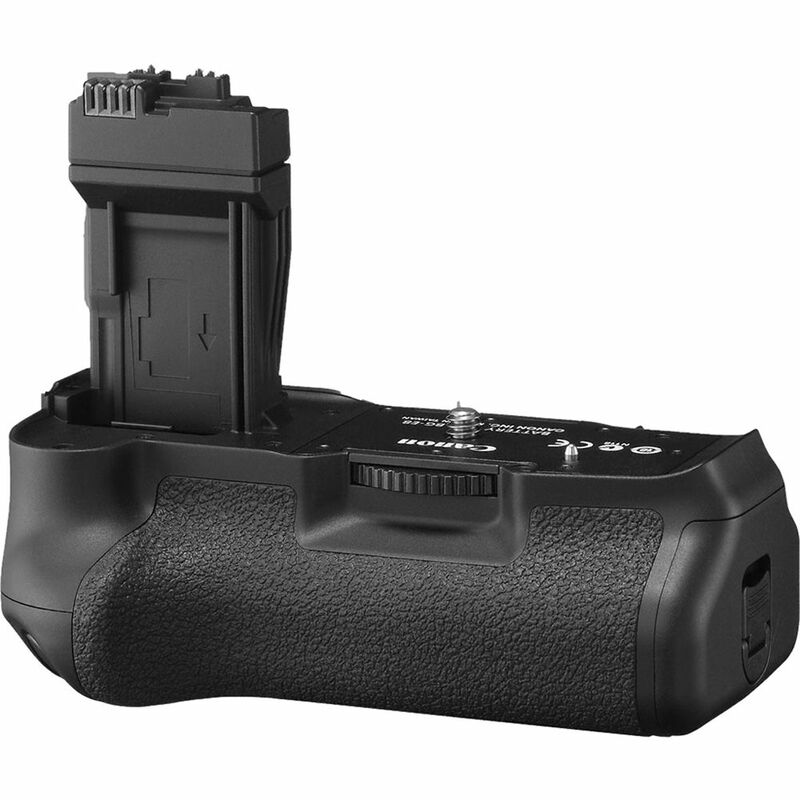 The Canon BG-E8 Battery Grip for the EOS Digital Rebel T2i, T3i, T4i and T5i DSLR cameras holds up to (2) LP-E8 battery packs simultaneously to effectively double your shooting power, plus the grip includes a holder to use (6) AA batteries. In addition, the grip includes a vertical shutter release and a mode wheel to provide access to all of the camera functions and make shooting with the camera in a vertical position just as comfortable as shooting horizontally. This grip is compatible with the T2i, T3i, T4i and T5i DSLR cameras bodies. BG-E8 Battery Grip for EOS Rebel T2i, T3i, T4i & T5i is rated 4.9 out of 5 by 325. Rated 5 out of 5 by Anonymous from Battery Grip Adds New DImension to the T As with all of the Canon battery grips this one for the T2i is well made and it fits perfectly on the camera. It is finished to a very high standard. The addition of the grip does not add a huge amount of weight to the camera, but it does add useful functionality and a more comfortable and safer war to hold the camera. The portrait orientation controls are a real plus. I have tried many brands of third party grips over the years and the Canon models are head and shoulders above the rest. The only downside for me is the price, but this is an example of you get what you pay for. Rated 5 out of 5 by DIGITAL TKO BY SAMSON from BUY IT NOW, YOU REALLY NEED THIS! WITH POWER DRAINING FEATURES TODAY LIKE AF/IS LENSES AND REGULAR USE OF LCD SCREEN, IN CAMERA PROCESSING, AND HIGH SPEED MEMORY CARDS THAT ALLOW MEGA STORAGE WE TEND TO OVERSHOOT RATHER THAN PLAN OUR SHOTS. COMPOUNDING THIS SITUATION IS THE OCCASIONAL USE OF BUILT IN FLASH. THE SOLUTION, ALONG WITH BETTER PRE-SHOT PLANNING IS FOR YOU TO DOUBLE THE CAPACITY OF STOCK BATTERY IN AN ATTRACTIVE GRIP. SAVING BATTERY CHANGE OUTS, AND GIVING YOU MUCH IMPROVED CAMERA CONTROL WHEN SHOOTING VERTICAL. MINIMAL WEIGHT IS ADDED TO THE BASE OF CAMERA AND WILL LEAVE YOU WONDERING WHY YOU EVER USED YOUR CAMERA WITHOUT THIS ESSENTIAL TOOL! Rated 5 out of 5 by jdm5lughatch@ from A much better decision... I debated and researched grips for about a week. All of the aftermarket grips seemed to have very inconsistant feedback. Either they worked great, worked for a while and then died or didn't work at all. B&H seems to have the best price on this as well like most products they sell. It might be 2 to 3 times more than an aftermarket unit but I ultimately believe it was worth the price. I was unable to a single review where the Canon OEM grip has failed and for that piece of mind I'm happy to spend a bit more. The grip feels great, fit is flwaless, and it works amazingly well with my new T3i. Definitely recommend it. The added weight is a nice addition as well. Rated 5 out of 5 by The_E from Highly Recommended for the T series This battery grip is highly recommended for your T-series Canon, as it really helps to balance out the camera and provide a more substantial grip. This is evident when you have longer or heavier glass attached to these small bodied cameras. The fit and finish is Canon all the way, with quality feeling levers, dials and buttons.The alkaline battery tray and the rechargeable battery tray are super straightforward to use, and the unit is intuitive to operate. I can't speak to how many shots you'll receive out of the grip with two fully charged batteries, as I haven't killed it yet at around 800+ shots.In short, I'm super happy with this purchase so far. Rated 5 out of 5 by JohnF from A Needed Addition I have been in photography for twenty five years. I have owned very cheap third party brands to name brand for a long time. Spend the extra money and buy name brand if you are serious about photography. This battery grip fits just like it should, works just like it should, and is the same build quality as the T2i. If you are going to spend the money required to be in photography in the first place, don't buy cheap equipment. Third party equipment might be cheap in price, but it is also cheap in build. You won't regret spending the extra money on this battery grip. Rated 5 out of 5 by Lper from Takes a great camera to the next level This battery grip transforms the T2i in ease of use and functionality. I often rotate the camera when framing to gain a different perspective in taking nature shots or for portraiture. The added accessibility of the second shutter release is a major advantage for comfort and stability. The feel of the grip is high quality, matching the quality of construction of the T2i itself. The contours are very comfortable and the rubber surface adds confidence in handling. In addition to the extension of shoot time provided by the double LP-E8 capacity, the ability to use AAs is a lifesaver. The grip does add weight to the T2i which in turn can result in slight muscle fatigue in long shoots. But this is more than offset by increased ease of overall use of the T2i. Rated 4 out of 5 by Broseph Murderface Murderface from Easy Peasy Lemon Squeezy with the BG-E8 This is the no nonsense version of the batter grip. The finish matches and the button function is perfect. The Battery tray holds 2 LP-E8's or you can load it up with AA's if you want (there is two draws that it comes with). The batter trap door pops off really easy from the standard camera body and it even has a little slip in piece to hold that door for you so it doesn't go missing... This does make your camera body a bit more bulky and a bit heaver, but that is pretty obvious right folks? Over all this is one of the best accessories I have purchased for my T5i to date... super comfy, super efficent, super quality. Thanks B&H !! Rated 5 out of 5 by KMaxim from Great Accessory! Adds some nice weight to my T2i-love the way it feels in my hand with it on, and makes the camera more stable when setting it down. Fits the camera to perfection and the 2nd shutter release is very useful when shooting portraits. When I first placed it on the camera, I wasn't so sure I liked it, but was in love within 30 minutes of handling the camera with it on. Prolongs the time between battery charges when 2 batteries are inserted, and includes the option to use 6 AA batteries if needed. This is an excellent accessory, and I can find no 'cons' to comment on. The weight of the Canon BG-E8 with batteries is 14.2 oz. Without batteries, this grip weighs 8.4 oz. Is the purpose of the grip just to store another battery, or are they wired in parallel? Battery grips such as the Canon BG-E8 are accessories that plug into the bottom of your camera, providing room for an additional battery and therefore longevity for shooting, as well as provide extra material to grip. Sometimes, battery grips are referred to as portrait grips, because they include a second shutter button that's more easily accessible while taking shots in portrait orientation. Will this work on a Canon T3? No. The BG-E8 Battery Grip will not work with the Canon EOS Rebel T3. Will this work on canon sl2? will it work with one battery in it ? Yes, the Canon BG-E8 can be operated with either one (1) LP-E8 battery by itself, two (2) LP-E8 batteries, six (6) AA batteries with the included AA battery tray, or the AC Adapter Kit ACK-E8 (optional accessory). All four options listed above would power the Canon EOS Digital Rebel T2i, T3i, T4i, and T5i DSLR cameras with the Canon BG-E8 battery grip. When using this battery grip - will the battery life levels appear on the camera's monitor? Yes, the battery levels will appear as usual when using the Canon battery grip. Does this fit on the T5 (1200D)? Answered by: MARK R K.